What to know: Fun and fabulous show about enjoying life, one day at a time. 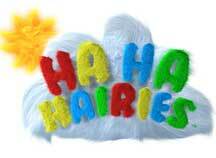 From the UK comes this three times BAFTA nominated animated pre-school comedy show where the hairier, the better. Sometimes, the whole world seems overgrown with different types of hair. This shows us a fun and colorful place to hang out with family and friends where you can enjoy. BAFTA winning and 3 times BAFTA nominated pre-school comedy show teaching kids to be generous, fun loving and inclusive. Singing, dancing and a lot of laughs!